L.S Systems approached us to provide a innovation-led redevelopment of their website. We developed a creative and user-friendly site to showcase their products and services in a logical way. The new website design needed to build in elements of interactivity to encourage higher levels of engagement with key content. In terms of the site navigation, it was vital to break down the high level of information into clear categories, such as: Horticultural Products, Horticulture Engineering and Irrigation Installation. This gives clear indication to the site visitor what section they would be able to access information most relevant to their search. We also developed a Content Management System (CMS) tailored to their specific needs. Whilst the CMS was bespoke to L.S, we also understood the need for this system to be easy to use/navigate so those at L.S could alter their own site when and where they wished – they now have the ability to input new ranges, information and pages. This is not just a brilliant site for the here and now, but one which will growth with the success of their business. 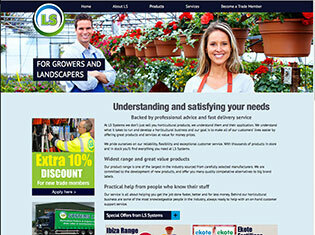 L.S Systems are a well established Lancashire horticultural and landscape industry suppliers. They have recently provided the irrigation systems for Football grounds (Bloomfield Road , Hampdenpark), Test cricket grounds and also more grass-root level sporting facilities. It is imperative that our websites not only look great, but also performed at a top level – it’s been a great project and one we have delivered bang on time and to speck. It’s quite a niche market, and our digital experts have been able to produce a great performing website that gives L.S an online presence and platform to grow and engage with their customer base.